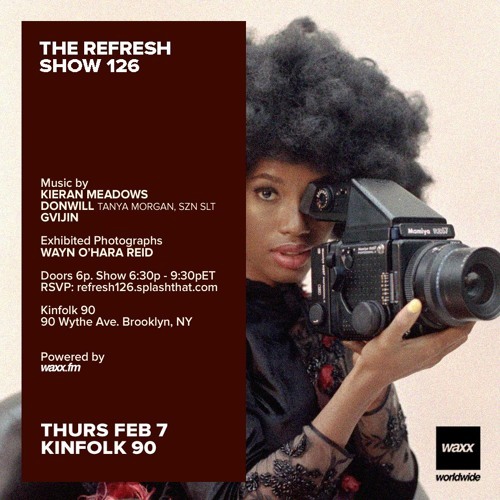 Show # 126 Originally broadcast live on February 7, 2019 from the storefront of Kinfolk 90 in Williamsburg, Brooklyn, New York City. Broadcast live on WAXX.fm. (Apologies for the beginning microphone technical difficulties.) Kieran Meadows' set — 0:00 - 1:02:00 Gvijin's Set — 1:02:00 - 1:44:00 Interview with Wayn O'Hara Reid — 1:44:00 - 1:52:00 Donwill's Set — 1:52:00 - end Follow The REFRESH™ (@ itstherefresh) Follow Kieran Meadows (@ kieranmeadows) Follow Gvijin (@ gvijin) Follow Donwill (@ donwill.me) Follow Wayn O'Hara Reid (@ whowantwor) Follow DJ Prince (@ wifiog) TRACKLIST coming soon. Enjoy. Educate Yourself. Support Good Music. Support Dope Art. Buy. Promote. Go to Live Shows. For The Lovers of Music, The Music of Lovers™ Copyright Disclaimer Under Section 107 of the Copyright Act 1976, allowance is made for "fair use" for purposes such as criticism, comment, news reporting, teaching, scholarship, and research. Fair use is a use permitted by copyright statute that might otherwise be infringing. Non-profit, educational or personal use tips the balance in favor of fair use. This drop is insane! What's the track name?